The Chimanimani Mountains are found within the Chimanimani National Park in the Eastern Highlands of Zimbabwe. The reserve is widely regarded as one of Zimbabwe's most treasured national parks and yet, there is precious little information available for those wishing to visit. 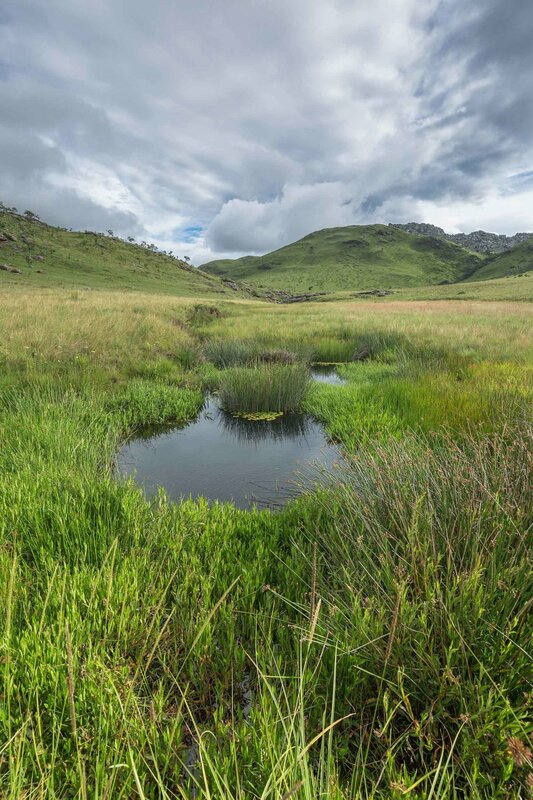 For example, one of the Chimanimani National Park's principal drawcards are the spectacular hiking opportunities it offers; however, rather astonishingly, there are no official maps of the region. To help those who, like me, suffer with an inexplicable taste for peculiar holiday destinations and might be considering a visit to Zimbabwe’s mountain frontier, here are a few things that I wish I had known prior to visiting. By Zimbabwean standards, the roads leading to the Chimanimani National Park are in good condition. Regardless of which route you use to approach the park, all visitors will ultimately wind up on the A10, a road that despite its rural location, remains a respectable driving surface. The favourable conditions of the A10 continue as far as Chimanimani village, at which point those bound for the National Park make a distinct right-hand turn and head for the hills (19°48'19.9"S 32°52'26.5"E). From here, the surface begins to break apart, with large patches of loose ground separating stretches of exceedingly old tarmac. A few kilometres further on, as one approaches a rural school (19°47'21.5"S 32°56'44.8"E), all-out gravel begins and the going gets increasingly rougher and more difficult. Advancing from here is slow, with visitors needing to navigate between rocks and ruts as they ascend towards the peaks. An especially tricky, rutted climb is found at 19°46'43.6"S 32°58'17.8"E, one that features a tight right‑hand bend about halfway up. The entire route can be completed in a typical urban sedan (I can personally attest to that), although my recommendation is to take a vehicle with better ground clearance should you have one. Of course, should you be so fortunate to have a four-wheel-drive vehicle, that would be best, but it is certainly not a requirement. The only official accommodation in the Chimanimani National Park is located at the campground adjacent to the Park Office (sometimes referred to as the Mutakaswani camp), as well as at the nearby Mountain Hut. The park manager does his best to maintain these grounds but, with little in the way of resources at his disposal, the facilities are in a state of disrepair. Nevertheless, the toilets are operational and reasonably clean, and hot water is provided courtesy of a donkey boiler which the superintendent fires up in the evening. In fact, if you can overlook a few maintenance issues, the camp is a perfectly agreeable place to stay, with a thick canopy of trees covering some of the most elaborate braai stands that I have ever seen. In its heyday, the facility must have made for a spectacular camping venue. As an aside, it is worth noting that the Park Office campsite is not the same as the Dead Cow campsite noted on some maps. The Dead Cow camp has been abandoned and is no longer operational. In contrast to the main camp, though, the Mountain Hut gets none of the attention lavished on the Park Office and is, accordingly, in far worse shape. The building leaks, has no running water and has a rat problem. As an alternative to the hut, those wanting to get a real taste of the mountains and not simply a view of them might consider wild camping, something that is permitted throughout the park. I would certainly recommend taking a tent and spending a few nights camping in the Bundi River Valley or, otherwise, making use of one of the many caves that dot the region. In total, the charge for one person spending one night in the reserve with their own vehicle is USD21.00. Having searched extensively for a map, the one shown below is a copy that was graciously given to me by a Zimbabwean hiker whom I met during my visit. It is the most accurate map that I have seen of the area, even if it is missing some of the more familiar map luxuries like distance markings. PDF availble for download here. The trail from the Park Office to the hut is known as Bailey's Folly. The route is 3.7 km long, with the first 2.2 km being an incredibly steep climb and the final 1.5 km being a gentle descent. The initial gradient is so severe that for a moderately fit person carrying a full backpack, the journey is likely to take 3 hours. Without a backpack, one can probably shave off an hour or so, making it a 2-hour walk. The path is easy to find and is very well marked with yellow arrows that have been painted on some of the rocks. The trail begins behind the water reservoir at the top of the campgrounds and makes it way directly up the hill from there. In addition, if, like me, you are concerned about walking the path and somehow missing the hut, don’t be. The trail literally deposits hikers at the backdoor of the building; there is just no way that one could end up accidently wandering into untamed Mozambique! Motoring in Zimbabwe has a reputation for being difficult, a reputation that is entirely deserved. Historically, both legitimate and illegitimate road-traffic infringements have been used to extort money from motorists by way of spot fines. Thankfully, in recent months, the country’s government has attempted to rein in on the practice and I am pleased to say that during our three-week visit, we were not fined once. We were, however, still subject to frequent military road blocks and on one occasion had our vehicle as well as wallet and purse searched. The reason, apparently, was that individuals are not allowed to travel with more than USD500 in cash. The legality of this rule is something I cannot comment on, but my advice would be to hide any rolls of cash you might have in the seat covers or some similarly clandestine location. Furthermore, a vehicle’s Temporary Import Permit (TIP) is one of the first documents called for by all officials. For details on the TIP as well as other border‑crossing information, please visit the Automobile Association’s Zimbabwe Cross-Border Information webpage, which we found to be accurate. Finally, the compulsory Third-Party Insurance is now issued automatically with the TIP, meaning that there is no longer a need to seek out a vendor at the border post. If you have any questions at all with regards to visiting the Chimanimani National Park, please do not hesitate to get in touch with me.